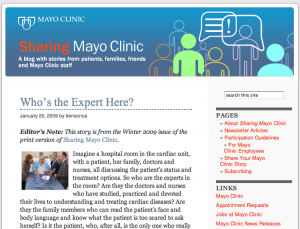 Today we take a significant step for Mayo Clinic, launching our “culture” blog for patients and staff, called Sharing Mayo Clinic. I’ll be showing it as part of my presentation at BlogWell. But in another sense, Sharing Mayo Clinic is less recent and more timeless; it’s a logical extension of what Mayo Clinic patients have been doing for more than a century. Word of mouth from patients is the number one reason people give as their source of information about Mayo Clinic. Like our Facebook page, this blog is just a new way for patients to share their stories. Sharing Mayo Clinic also will be a way to feature the work and stories of Mayo employees in various roles throughout the organization, who all contribute to creating the Mayo Clinic experience for patients and their families. The blog is a work in progress, and we look forward to seeing it grow into a hub for Mayo Clinic’s various social media platforms. We have some ideas for new features and functionality once we’re past the launch stage, but I’d really like to know what you think of it so far, and how you think it could be improved. Please check it out and give me your feedback! And I’d really appreciate it if you’d take the time to pass this along to your friends using the “ShareThis” icon below. Looks great Lee, congrats on the launch. My one suggestion would be to segment off a section for subscribing by Reader or email. I see that you have the “subscription” page which is a nice layout, but you may help capture more readers by putting the infamous RSS symbol along with a email subscription link right on the home page. Great job. Good thoughts, Scott. We’ll tweak that. Look forward to meeting face-to-face today!